I usually experiment with new barbecue sauces this time of the season. They're easy to make, store in the refrigerator and everyone loves them with chicken wings or veggie patties (we have a home full of vegetarians). It's getting hot in the Bay area, and it's time for us to organize a pool party to celebrate the end of school and the beginning of summer holidays. Last night, we prepared soyrizo mushroom patties to go with honey barbecue sauce. The mixture of the patties was made of soyrizo, chopped button mushrooms, liquid smoke, bread for texture and kidney beans for added protein. Unlike many vegetarian dishes, these burgers won't leave you wishing for meat. The texture is interesting and non-uniform, and the flavor is very bold. It's not a meat substitute, but rather a unique dish unto itself. Little Aria and I loved them too! Flatbreads are great because you can load them up with whichever ingredients you like. They're also very versatile and can be served as a main course or cut up into bite size appetizers. Since I recently purchased a molcajete, the typical, hand-carved Mexican mortar and pestle made from natural volcanic stone, I decided to put a Mexican twist on my flatbread. I gathered diced Ataulfo mangoes, green apples, jalapeños, red onions, Persian cucumbers, lime juice and tomatoes. 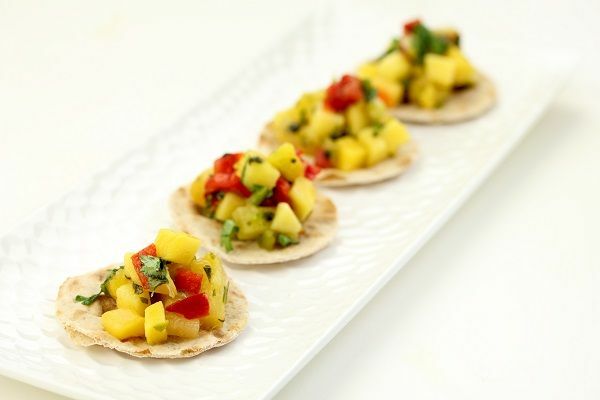 The exotic salsa would make a tasty, healthy snack all on its own, but it's even better spooned onto California Lavash flatbread. Yum! I think I've said in previous posts that my mother-in-law recently discovered she was gluten intolerant (when she decided to become a vegetarian a year ago) . Her diet has changed drastically but we try to keep her palate happy. 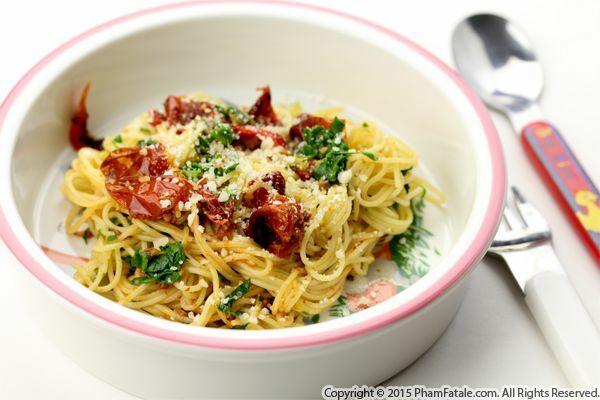 Here's a gluten-free dish that doesn't leave her missing bread or pasta. I pan-fried pre-cooked polenta medallions and used them as a substitute for the burger buns. I topped them with melted provolone cheese, sautéed baby spinach and soyrizo (you can replace with real meat). I served the polenta burgers with steamed vegetables, so we had a delicious light meal that fit everyone's diet in our home. My mother-in-law has been adjusting to her new diet very well these days, although I have to admit it was so cute but kind of sad catching her smelling and "hugging" freshly-baked loaves of bread in the kitchen over the weekend. ***The photo was taken with my phone. The moms at little Aria's preschool gather weekly for lunch so the toddlers get to interact more and have fun while enjoying food together. During these lunches, I've noticed that any round-rod, long strand type of pasta is always a favorite among the little ones. Yesterday, I prepared capellini pasta with roasted tomatoes and it was a true success. I simply sautéed the very thin noodles in butter with spinach and added pre-roasted cherry tomatoes at the end. I completed the children's meal with small-sized meatballs. It was a great, healthy way to get the children to eat their veggies. My husband Lulu hasn't been traveling at all for work these days, so I'm back to my old habits. I often attempt a similar meal to his, even though he's a vegetarian. That way we can "share the meal" and we can give each other feedback about the food. Last night, I made turkey rolls that I wrapped in carrots. My vegetarian substitute is dried bean curd. So what is dried bean curd, you may ask? Contrary to what you might think, it's not made directly from tofu; it's a more pressed version of soybeans and is usually smoked; it contains 40% less liquid than standard firm tofu. It's packed with protein, super healthy, yet still flavorful and it's a great meat substitute. I prepared the filling of the rolls with the dried bean curd, fresh wood ear mushrooms, onions that we grow in our garden and Japanese sweet potatoes for natural sweetness. Remember, you eat with your eyes first! So I enhanced its look by wrapping the rolls in carrot to give them a fancy flair. You'll be surprised; it's not that complicated to make a dish look a bit more appealing. I'll be sharing the meat version tomorrow. Stay tuned! Page 163 of 163 pages.